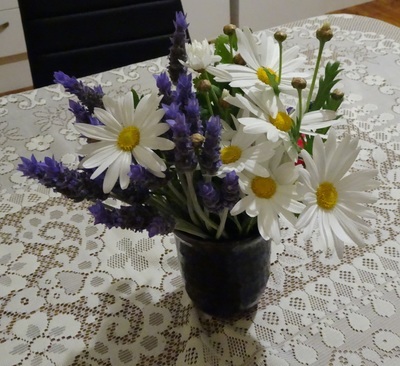 I love picking flowers from the garden and displaying them in the house. The obvious thing to put those freshly cut flowers in is a vase. I have plenty of vases and have in fact donated surplus ones to the op shop. However, I sometimes like to be a bit creative and use something different. At other times I have an item I never use for its original purpose and so I pop some flowers in it. I think flowers are great as a way of decorating the home. I am not a tea drinker. I tried, I really did, to get into drinking tea as it is supposed to have some health benefits. After a while I gave up and the white teapot sat in the cupboard unused. 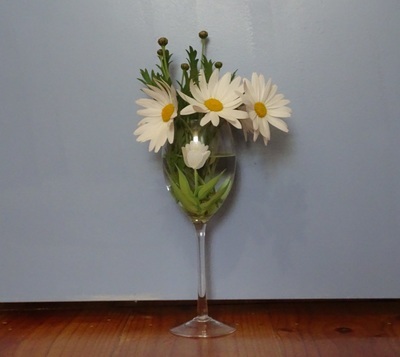 Now I use it for displaying flowers and think it looks particularly pretty with pink daisies. 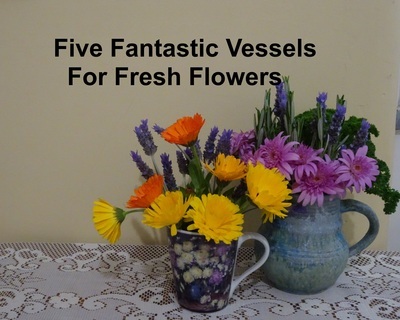 A mug makes a lovely vessel for short stemmed flowers. 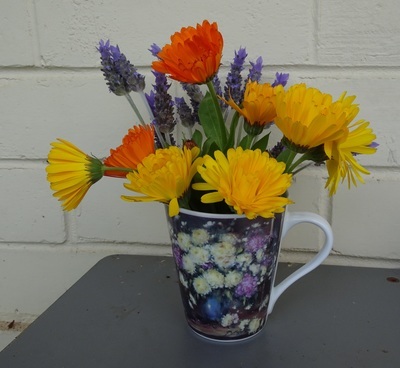 You may choose to match some of the flowers in your posy to the colours of the mug if you like. It only takes a few flowers to make a nice display in a mug. There was a time when I used jugs for milk when visitors dropped in. These days I have a choice of full cream and skim milk in the fridge and let guests choose which type they want. I serve the milk straight from the carton and then put it back into the fridge so it stays cold. There are so many attractive jugs around but in my house, like most, they won't get used for milk. However, I have kept a couple of favourite jugs for flowers. 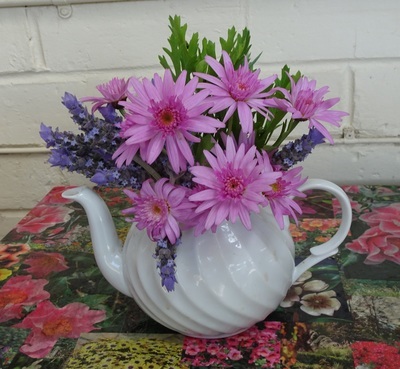 If you don't have a jug sitting around you can use for flowers you could buy one cheaply from an op shop or garage sale. I had one wine glass left from a set of four. I thought it was pretty but it wasn't being used any more. Then it occurred to me it would look attractive with a few white daisies in it. Any waterproof pottery container can be used for flowers. I was recently given a glazed pottery vessel. It could be put to a variety of uses and I will probably vary its use over time. For the moment it has flowers in it because there are plenty of blooms in my garden. Vases are great for displaying flowers but sometimes another vessel can be repurposed and given a new lease of life.